What does it realy mean to be a man? 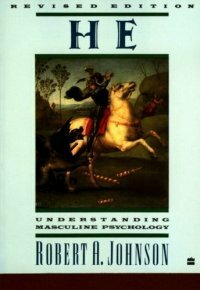 What are some of the landmarks along the road to mature masculinity? And what of the feminine components of a man's personality? Robert A. Johnson explores these questions in this new edition of He, updated to reflect his thinking on these subjects. Women do not really know as much about men as they think they do. They have developed, over the centuries, considerable expertise in the technique of adapting to men, but that is not the same as truly understanding them. Women often labor under the delusion that life is really pretty easy for men, at least when compared to their own lot, and they have no idea what a complicated struggle is really involved in the transition from male childhood to real manhood.